For those of you who follow my blog and Flickr posts, this is an insight into my current photographic work dedicated to Thailand, and the abundance of temples and monasteries that frequent both the urban and rural landscapes. In this post I will cover in more depth my motivation behind the project. Why photograph temples? I'm currently working with a photographic process known as High Dynamic Range. Much like the old 35mm film cameras your shots are only half-way to completion once the exposure is taken. The final part of the process is run on my lap-top, where one is able to see if the resulting exposure(s) has created a satisfying image, or not. Through trial and error, and a lot of luck, I found that the temple Wat or temple complex buildings lend themselves to the process, very well. With a high amount of intricate detail and a rather stylized architectural aesthetic I was able to work on a formula that makes best use of the process of High Dynamic Range, and the abundance of wats in the region. What's the appeal? Part of the appeal of photographing temples is the journey. The idea of the journey also rings true in Buddhist philosophy, and is a compliment to the reflection of creativity and process in general. Although, I'm not religious, aspects of Buddhism are extremely appealing to me. And, as such, it's intentions seem transparent enough to pursue out of a heartily interest. How do you find Temple Wats? With little means at my disposal it's hard to set my mind on large and ambitious projects. I'm an explorer at heart. So, I use this drive and the assistance of a late model 125cc motorcycle in the hunt for new subject matter. I'm presently located close to the murky metropolis of Pattaya, Chonburi Province. A melting pot of industrial, commercial, residential and agricultural land which blends seamlessly into the outer suburbs of Bangkok, to the West; on through rural landscapes to Rayong, Trat and Cambodia to the East. Trips I've made on multiple occasions via the network of roads and public transportation infrastructure that connect Thailand's towns, cities and villages. I became aware after a short while that most of the larger roads (in England we call B roads) connect temple wats (temple compounds). Like schools in China or Walmart in the states. The temple Wat is often the center of the community. Therefore, all roads lead to the communal hub of the village or town. Often signed by a large gate marker. 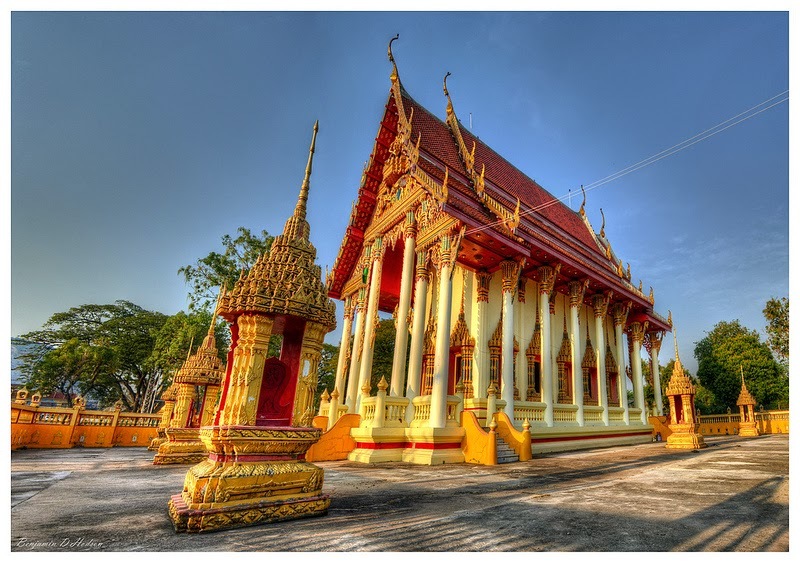 Sometimes not more that a few kilometers apart the wat is a statement of the communities wealth and devotion. Each compound has it's own finger print; no two are the same. I find myself navigating by temple. Slowly building a picture of geographical markers rather than the help of a map or GPS. In some respects, it feels much like exploring in past centuries. One is unsure what might be around the next corner, a few miles down the track. Maybe the next big picture. Or, what you might encounter on your journey. That in it's self is inspiration enough to keep riding and exploring Thailand and it's ubiquitous culture of Buddhism. Questions? If you have any further questions about this article or would like to tour Thailand by motorcycle please feel free to contact me using the details provided.